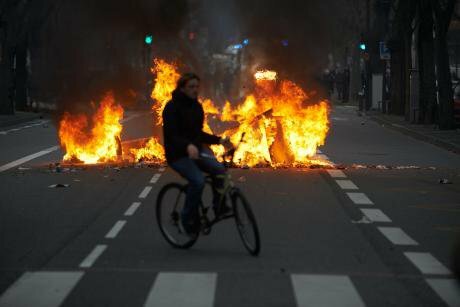 Image: Gilet Jaunes protests began as a protest against tax increases on oil products. Toulouse, 29 December 2018. Credit: NurPhoto/SIPA USA/PA Images, all rights reserved. 2018 also saw growing momentum for climate movements in confronting political inaction. From the Extinction Rebellion movement in the UK, to thousands of school children on strike in Australia (and similar movements elsewhere). Climate demonstrations in Europe bigger than ever. A record 5,000 people joined civil disobedience to protest coal mines in Germany. A number of laws were also passed that pointed in the right direction: Ireland and a number of cities divested from fossil fuels; the EU gave backing to citizen and community-owned renewable energy, and Spain lifted the controversial 'sun tax'. The costs of renewable energy and energy storage also fell. We must encourage and support communities and municipalities to take control of their own energy needs and wants, putting solidarity as a central value. But energy democracy needs to operate at all levels - local communities, regional and national governments, and international institutions like the EU.